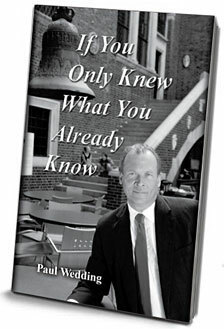 Paul Wedding has quickly become an influential leader in positive human development. Paul teaches people from all walks of life, all across the Country, life changing principals that are truly fresh and authentic, from a delivery all his own. A masterful storyteller with an amazing personal account, Paul promises not only are the changes he speaks of possible, they’re inevitable. No stranger to turbulent times, Wedding has faced adversity most of his life, meeting it head on. Before returning back to the State of Michigan in 2005, he lived in Westminster California. Destitute and homeless, Wedding lived and ate from a dumpster behind a Chinese Restaurant. Begging for change to feed his destructive vices, the pen and paper would become something more than a way to pass the time. In his inspiring and uplifting book “If you only knew what you already know,” Paul details some of his own personal struggles and the moment of clarity that would change his life forever. The main theme to this book is that life is not so much about learning things as much as it is remembering what we already know. This book also gave Wedding a new title, best selling Author. Paul’s second book titled “The Inevitable Life” is due out in late 2012. Wedding earned the recognition as a leading expert in positive human development for his work in the book, a virtual how to make effective changes, or reinforce what you already believe. He does not care for the term self help, but rather personal empowerment by choice. By following what’s written in the book, not only living an empowered life possible, it’s inevitable. Since the release of his first book, the 6’3” Author made the transition into public speaking. His passion is in the speaking role, this passion comes through during every presentation, seminar, and lecture. Connecting with his audience, speaking to issues people can intimately relate with, his sincerity, demeanor, and authenticity are felt by each individual present. When he’s not speaking to groups about personal empowerment, Paul has a Private Practice in Sterling Heights Michigan, working with individuals on a one on one basis. The scope of Paul’s practice is assisting others navigate their way through the self imposed defeating beliefs and blocks to where they desire most to be in their lives. The Paul Wedding Show, a talk show heard locally in the Detroit market, is a call in talk show solving problems of Relationships, Spirituality, Health, and Finances.